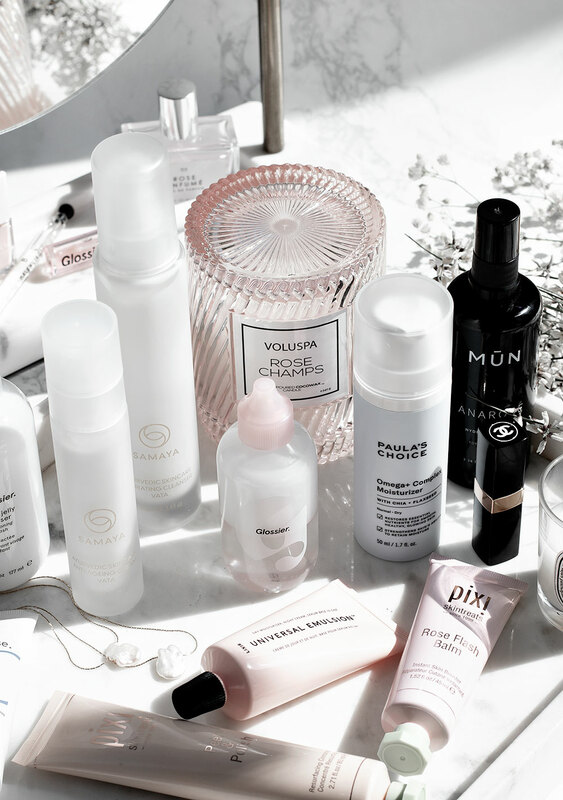 The skincare world is definitely not a “one size fits all” kind of a thing. I love the fact that we’re all becoming more knowledgeable in terms of our skin’s needs and product ingredients. I mean, as long as you don’t take skincare advice from those viral DIY recipes you can sometimes find on Pinterest. One of the most interesting product ranges I’ve been using over the last month or so, have to be Samaya* products. It’s an all natural brand of products based on Ayurvedic principles that are supposed to help you find a “perfect balance”- starting with your skin. According to ancient Ayurveda holistic healing system, every one of us has a unique mix of three mind and body principles, which create specific traits and characteristics. Those three principles are called doshas: Vata, Pitta, and Kapha. 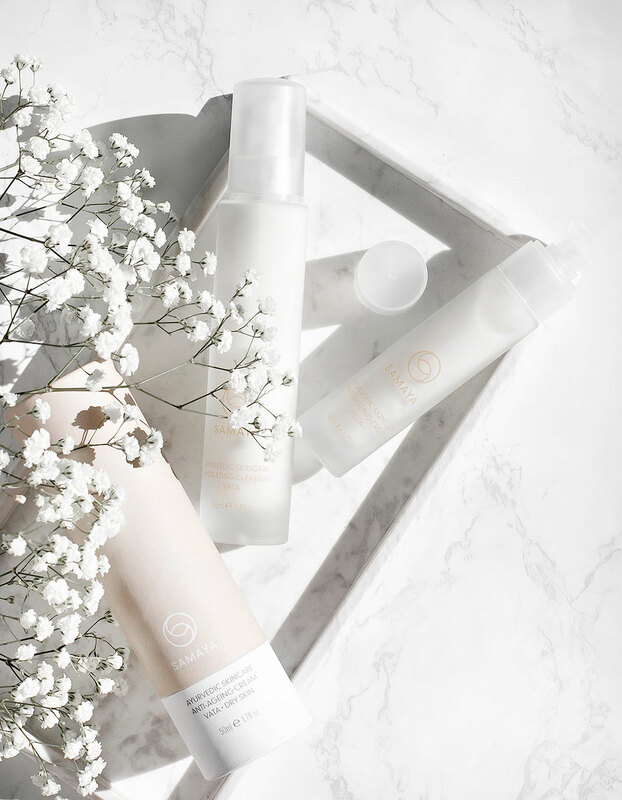 On their website, Samaya offers a quick test to help determine your dominant dosha and you can then explore personalized product recommendations. The quick quiz found that my dominant dosha is Vata which Samaya describe as “Energetic and creative in balance, but worried, tired and indecisive when out of balance. Often of slender build and suffers from cold hands and feet. Tends to have delicate dry skin and hair, which may need extra moisturizing and nourishment to keep it glowing and healthy.” I was actually a bit surprised at how accurate and spot-on this description was, especially the part about cold hands and feet and frustration when feeling out of balance. But let’s talk about the actual products. I’ve been using the Vata Hydrating Cleanser* and Anti-Aging Cream* for nearly a month now. Both products check off a lot of my “must” boxes when it comes to skincare. First, the packaging is not only beautiful but very convenient. I love that the bottles are glass, simple and come with pump dispensers. Second, both products are incredibly gentle and if I were to use just one word when describing how they make my skin feel, it’s definitely “balanced” which is what my skin always needs, especially since I’m using strong retinoid products that tend to dry it out. Both the cleanser and anti-aging cream products are formulated with ingredients I love and a few that I actually take as supplements (like Ashwagandha and Turmeric). As expected with all-natural skincare products, they’re also formulated without synthetic colors and fragrance which, of course, I love. I’m definitely very impressed with both products and love how simple, gentle and effective they are. The Anti-Aging Cream, in particular, helped restore that well-balanced feel to my skin and with regular use, I noticed an improvement in skin’s elasticity as it felt more plump, soft and supple. The Hydrating Cleanser is perfect to use as a first step in night-time double cleanse routine. 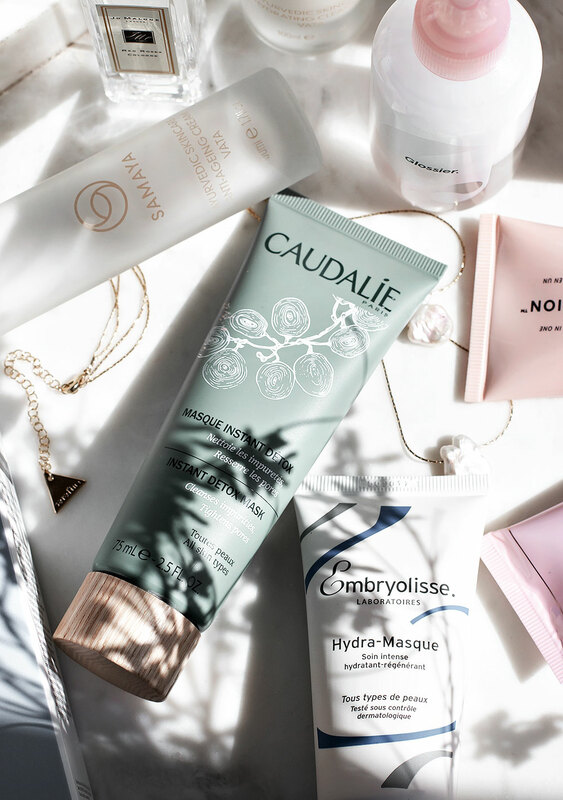 Caudalie Instant Detox is another product I’ve been reaching for on a regular basis lately. This mask is a perfect product for spring and not just because it’s a “detox” mask. I find that during this time of year my skin always changes and becomes a little more oily and congested. Love the cooling effect this mask has and that it helps reduce that excess oil without drying out my skin. Unlike some clay-based masks, this one is very easy to remove, you need just a very thin layer and the tube packaging guarantees a mess-free application. I’ve used quite a few clay masks that come in jars and that stuff just gets everywhere. My favorite little mid-week pick-me-up includes this mask, Black Tea Kombucha Antioxidant Essence from Fresh, and Samaya’s Vata Anti-Aging Cream– this combo always leaves my skin feeling fresh, balanced and gives me that “I can’t stop touching my skin” kind of softness. 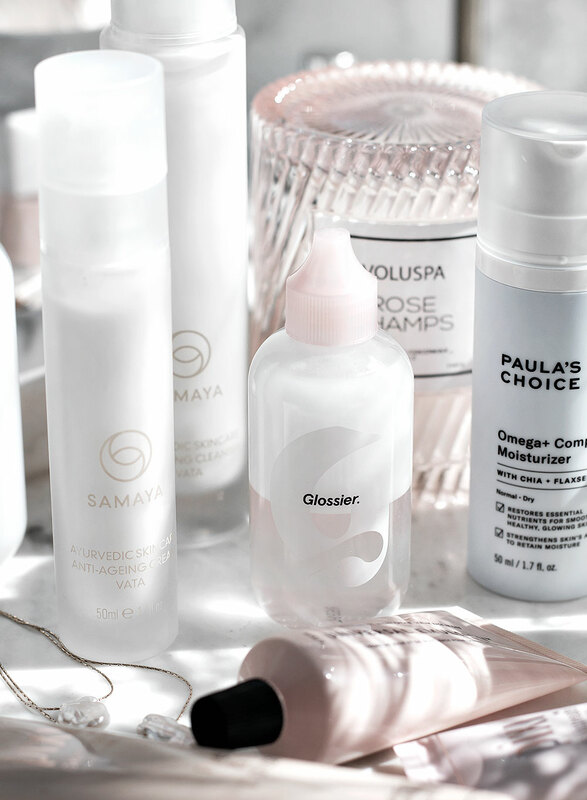 Glossier’s Milky Jelly Cleanser is one of my most loved products from the brand. I always have to have an extra bottle stashed in my bathroom. I recently tried their Milky Oil– a mix of micellar water and oil that is supposed to help remove long-wearing makeup and waterproof mascara. First thing’s first: the bottle is tiny, but considering the price ($12) I wouldn’t say it’s outrageously overpriced when compared to the rest of their products. I really love this oil but not exactly for removing heavy makeup. If I were to use this to remove heavy makeup, I’d probably have to use a 1/4 bottle of the product. For me, this works best for removing my daily, minimal makeup. I don’t love using my cleansers to remove makeup so I usually reach for a micellar water product as a pre-cleanse step, and then follow up with a double cleanse with my Akwi and Milky Jelly cleansers. So yes, I love Milky Oil, just not for the purposes it is being marketed for. 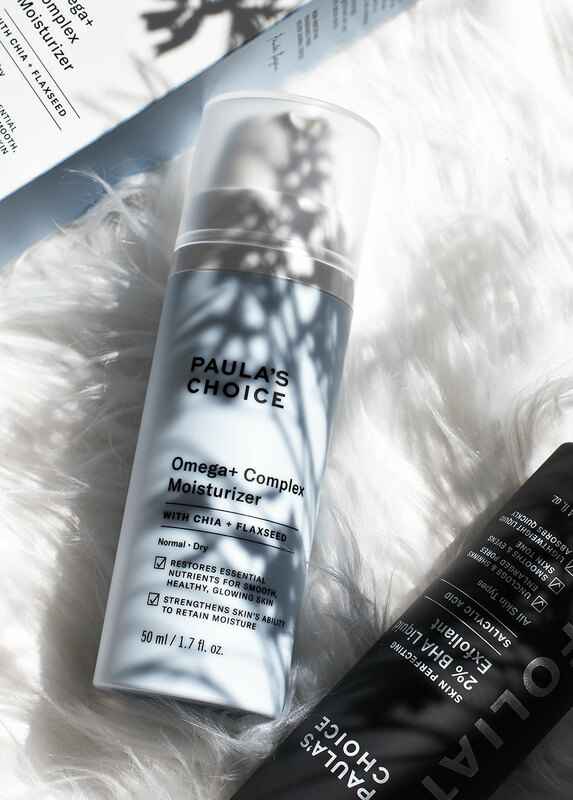 Paula’s Choice Omega + Complex Serum has been one of my favorite products for a couple of years now. As I already mentioned in a bunch of my other skincare posts, it’s one of the best products for dry skin I’ve tried and was a vital part of my skincare routine when I was on Accutane. PC recently released the Omega + Complex Moisturizer* so, unsurprisingly, I was very excited to try it. Everything that I love about Paula’s Choice products is here, of course (packaging, gentle formula). My dry skin immediately fell in love with this moisturizer. You might remember me mentioning that I can’t find a single moisturizer that can help my dry skin on its own (other than the Cetaphil in a tub). Well, it looks like I’ve finally found the one. The Omega + Complex Moisturizer* has a very rich formula so you really only need a small drop to cover the entire face and neck. It really helps to keep my skin happy, plump and flake-free. Even though it’s said to be a “lightweight” moisturizer, on me it does feel a bit heavy which is why I prefer using it at night and only need a small amount of product. MUN’s Anarose isn’t exactly a “new” product for me, but I always like re-discovering old favorites. It’s one of my most-loved face mists (I talked about them all right here) that helps tone and balance the skin. Another one of my “re-discovered” products is Pixi’s Peel & Polish enzyme peel. I usually like my peels in a pad-application form (like the Dr. Dennis Gross Alpha Beta Peel or m–61 Power Peel) but there’s something really nice, easy and convenient about Peel & Polish. You just massage it in, leave it on for two minutes and rinse clean. It’s also not as intense as my other favorite peels, so it’s great to use when my skin is on the sensitive side. With my picky skin, I do have to be careful when introducing new products, especially during changing seasons. This bunch right here, along with a couple of old favorites, proved to be gentle enough and helped keep my skin happy as it went from very dry to combo. Do you guys tend to switch up your skincare routine in spring? 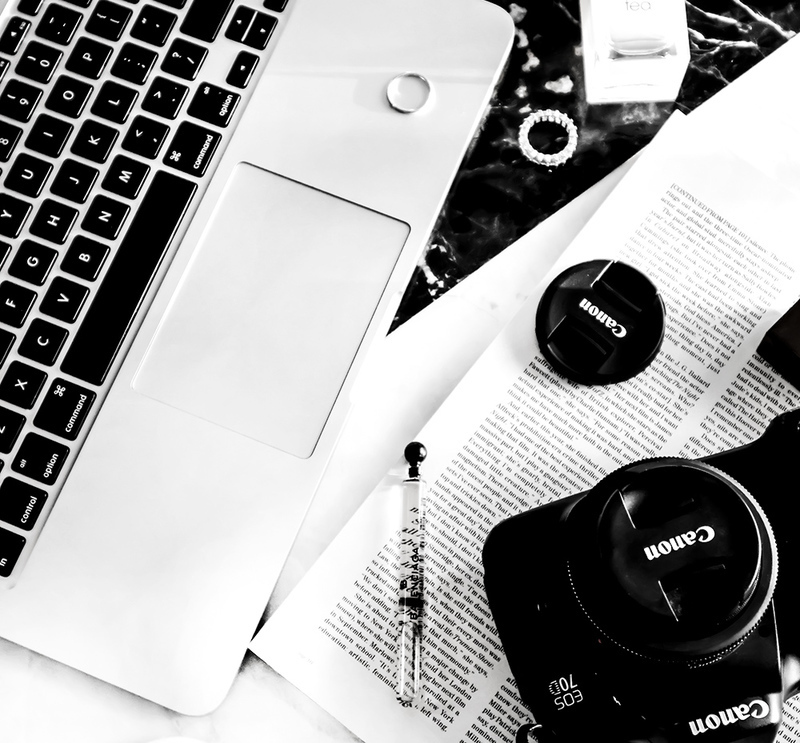 Any new products you’ve recently discovered and fallen in love with?